Prior to initial use, all new, extensively repaired and altered cranes should be tested by or under the direction of an appointed person to confirm the load testing of a crane. Test loads shall not be more than 125% of rated load. The test reports shall be placed on file where readily available to appointed personnel. CraneWerks has 16,000 lbs of portable test weights and a test weight skid that weighs 2500 lbs. 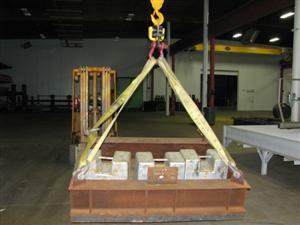 we have the capability of load testing up to a 7.5 Ton cranes with these static weights. 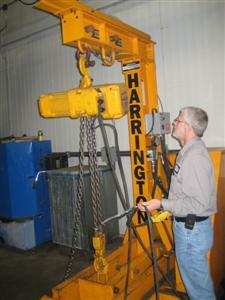 We are qualified to load test cranes of all capacities using water weights and other static weight options. Additionally we have a portable test stand that can be used in our shop or transport to your plant to load test up to 10 Ton hoists, slings and other lifting apparatuses. A common “Urban Legend” is that an item of unknown capacity can be load tested at 125% of desired load and that a certificate can then be provided that states that this item is certified for the rated load. FALSE. In fact the act of load testing an item can actually damage the device being tested if it was not originally designed for the proper load. Load testing should only be performed after a structure, crane, monorail, jib, lifting beam, sling, etc. is known to have been designed to properly support a load and is in good physical and mechanical shape. A full visual inspection is recommended prior to load testing any item and if the designed load of a device is not known, in most cases reverse engineering can be performed to calculate the strength and capacity of an item. Often times load tests will be coupled with inspections. For more information on these services, please check out our frequent and periodic crane and hoist inspection programs. CraneWerks can provide on site or in shop load tests for your equipment. Please call our service department at 888-544-2121 or fill out the contact us form for more information.